With Teen Titans: Titans Around the World, Geoff Johns knocks another story out of the park. I know there's a general outcry over "writing for the trade," but Johns shows great skill in the two four-part stories collected here. Though connected, each story contains its own beginning, middle, and end, and each balances well between being self-contained and setting up future storylines. Indeed, as a One Year Later story, Titans Around the World is specifically geared toward new readers; Cyborg has been comatose for the missing year, and as such serves as the reader's guide to the Titans' new status quo. At the same time, the story is a long-time Titans fan's dream, checking in with a bevy of Titans past. Johns also appears to have been given carte blanche to create a number of new Titans to replace the departed Superboy and Kid Flash; we see here, among others, kid sidekicks for Captain Atom, Black Adam, Power Girl, Plastic Man, and especially Martian Manhunter. Though Miss Martian's origin is completely inconceivable (perhaps suggesting there's more to it than initially revealed), there's a certain joy to this, as if in the New Earth continuity won't get in the way of positive character developments. Superboy and Kid Flash's absences are still palpable in the title, but Johns offers compelling additions in Kid Devil, Ravager, and Miss Martian. If anything, Johns appears to have given himself almost too much fodder to address in future stories, from the lost Doom Patrol Members to the untold mission to New Azarath, Kid Devil's secret origin, and even the mysterious substitute Titan Talon, evocative of the animated Titan Red X. This confusion is only increased by the sense that Johns not only foreshadows, but "back-shadows" at times to events playing out in the missing year told in 52. The most effective subplot, however, is the distinctly creepy romance between Robin and Wonder Girl in the wake of Superboy's passing; Johns imbues this with all the awkwardness it merits, though whether the plot is resolved or not at the end of this trade is unclear. There may, perhaps, be a "Johnsian arc" to the stories that Geoff Johns writes; be it Titans or JSA, there's something that always feels imminently familiar when I'm reading a story by Geoff Johns. At the same time, these stories are for the most part solid, cogent, and well-written, enough so that treading plowed ground doesn't seem like such a bad thing. 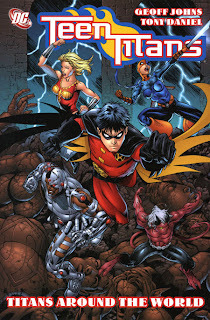 If you still haven't picked up Teen Titans (who are you? ), Titans Around the World is a good place to start. So, who's your favorite "world Titan?" This was actually the first Teen Titans book I bought - it's an OYL title so I thought, why not? As a new reader, I thought it was rather disappointing. It's not that the story is hard to follow; it's easy to understand, flows quite well and has its moments. But Johns just doesn't make me care about the characters and the changes they've all been through. I imagine longtime readers would get a kick out of seeing the cast be put through the wringer, but as a new reader I just don't care about Robin and Wonder Girl grieving for Superboy, or all the other subplots that were going on. Not enough to check out the next trade anyway. One of the few TPBs I bought that I wish I didn't. If you're a new reader who wants to check out the Teen Titans I'd argue that you're best starting off with the very first volume. I have to say, Cassie Sandsmark being on of my favorite characters....I'm speechless. They are having her be romantic with Robin this soon after Superboy died. Nice. Why not have her stand on a street corner under a lamp and ask men if they "want a date"? Does anyone else think DiDio has a stack of YJ comics in his office he pees on and uses for toilet paper? Jeffrey -- So surprised! I had such a different reaction to this one. But thanks for commenting; it's interesting to hear a different take on it. Michael -- In the context of the story, the moment between Robin and Wonder Girl makes perfect sense--it's not a romance per se (I should have been clearer in my review) but an unexpected kiss that they share while crying for Superboy, one that they immediately regret. It's not something the story portrays as a good thing, but rather an emotional difficulty for the characters. My take on Dan DiDio is different than yours; I'd be eager for you to read Titans Around the World and report back what you think.